As the snow covered playing fields all over Switzerland attest, the winter season is clearly upon us. 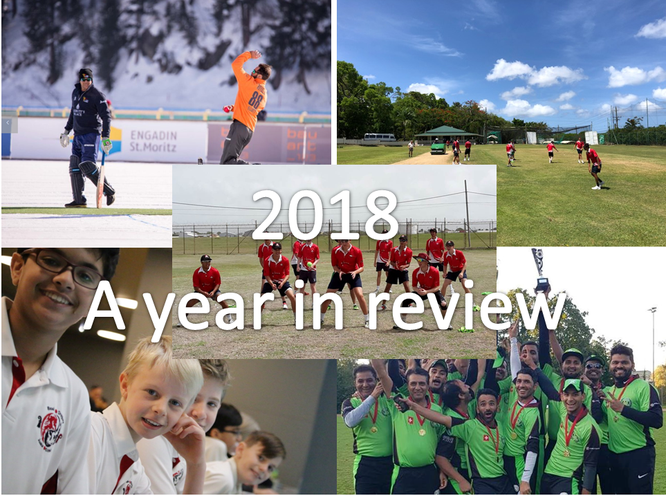 But as the end of the year fast approaches it provides us with an opportune moment to review the news & articles covered by the Cricket Switzerland website over the last 12 months. The Cricket Switzerland website, along with our social media presence and monthly eNewsletter, continues to play an important role in the communication of all our efforts to develop cricket as a sport in Switzerland. 2018 began as members of Swiss Olympic, a momentous achievement for cricket in Switzerland. This is the single most important milestone for the sport in this country as, for the first time, we can now claim that cricket is a recognised Swiss sport. 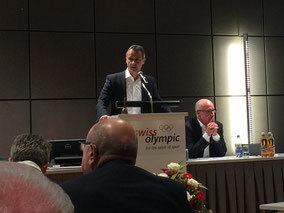 Membership of Swiss Olympic not only provides crucial financial support to the sport, it also inspires us to comply with the sporting vales of the Olympic movement in providing transparency, respect, good behaviour & best practices and accountability. Also significant in 2018 was the realisation of St Moritz Ice Cricket. 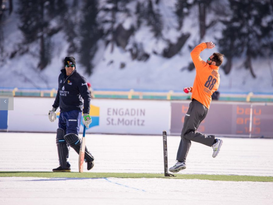 St Moritz Ice Cricket witnessed many of the sport’s greatest stars play in two exhibition Twenty20 matches on the lake in St Moritz. In parallel with the Cricket On Ice amateur version that has been running for 30 years, St Moritz Ice Cricket welcomed the likes of Virender Sehwag, Mohammad Kaif, Jacques Kallis, Graeme Smith, Shahid Afridi, Shoaib Akthar, Matt Prior, Mahela Jayawardene, Andrew Symonds, Michael Hussey, Lasith Malinga, Aiden Andrews, Rohan Jain... the list goes on. It provided us a platform to show off Switzerland to the cricketing world. It was televised live in India, South Africa, Pakistan & Australia, to the largest audience for any sporting event in Switzerland. I welcome the sequel to this planned by Vijay Singh and his team for 2020. Moving on, the Annual General Meeting welcomed Farid Din & Matthew Martin to the executive and Hascal Gollop in a non-executive role. 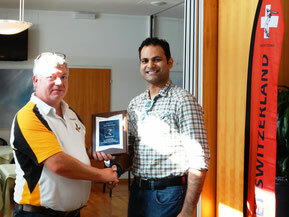 Rajan Thambehalli received a plaque of appreciation for his services to cricket & his individual achievements in the five years he spent on the committee working for cricket. The AGM also accepted Zug Cricket Club back to the fold, and the Association Genevoise de Cricket, whose aim it is to promote cricket in the Geneva area by pooling resources & talking with one voice to the authorities. In the media we made it onto CNN Money and the St Galler Tagblatt ran a series of articles explaining cricket & the achievements made by SGCC. Our efforts & ambitions to attain ICC status was covered in an article on the Cricketer Magazine Online. As in neighbouring Germany, the migration of cricketers to Switzerland made the media on various occasions too. 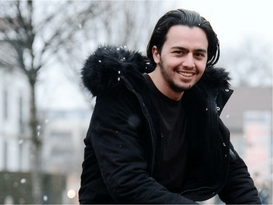 The Winterthur Landbote covered the story of Swiss U19 cricketer Nawraz Jabarkheel who walked 6000 kilometres to come to Switzerland, while the Swiss Immigration Services made a short film about Dr. Gautham Yepuri. Cricket Switzerland embraces all forms of cricket and encourages participation at every level. It is important to underline that the association is not exclusively for the hard-ball game but that it also supports other forms. 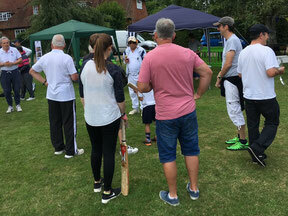 The website actively demonstrated this with our encouragement and publicity of such events such as the Olten Tennis Ball Cricket Competition and the good work by Father Devid in Basel at the Village Family Cricket Fun Day. 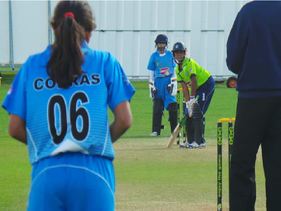 Women's cricket continues to flourish. Zurich Sapphires are well established and in 2018 Geneva brought together a group of ladies to realise the beginning of a ladies team in the west of the country. The achievements of our juniors made headlines throughout the year and we thank the coaches for their contributions with some comprehensive reporting of junior events. Events such as the annual Basel Summer Cricket Camp with BDJCC & T20 Cricket Company and their annual Basel Indoor series for U11s, U13s & U15s and the Gingins indoor series later in the year. A reflection of the good work by all the coaches & parents involved in our junior development was illustrated by the story of two 12 year olds, Owen & Ethan, both of whom had learned their cricket here and on recently returning to Australia, were contesting well there. The Swiss Junior Cricket Festival in Zuoz at which hundreds of youth of all ages and sexes compete is the single, largest junior event by far and we acknowledge the support of the Lyceum Alpinum in achieving this. Then there was the Leman Cup & Romande Cup (U11 & U13) supported by Cossonay CC. 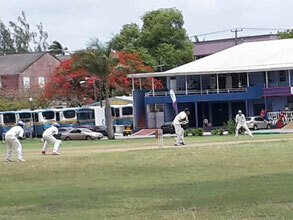 There were also international tours of course for U12s, U14s & U15s in 2018 in Leicester and U11s & U13s to Surrey, while the U19s had a one-in-a-lifetime experience at the Sir Garfield Sobers Academy competition in Barbados. And the individual achievements of our juniors was again recognised by the presentation at the end of 2018 of the Bob Barber Awards (by ex-England Bob Barber) to some of our budding stars. The senior domestic season began as always with the David Barmes Memorial Trophy. 100+ competitive senior matches in the two domestic competitions were well documented with all scorecards recorded in CricHQ with a multitude of match reports. As was Asad Mahmood's record-beaking 176 in a T20. 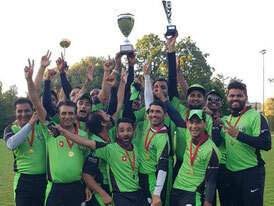 St Gallen’s achievements as the number one senior club in Switzerland went undisputed as they won both the Swiss Mr Pickwick Twenty20 Final hosted in Berne and the CSPL Final played at their home ground in Obergösgen. Internationally the seniors experienced mixed fortunes. They finished 3rd in the T20 in Warsaw, won the ODI series in Prague and lost to Iceland in a rain-affected weekend on grass in the UK. 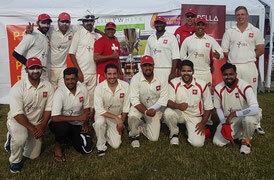 Senior club tournaments & events were also plentiful and included the Zuoz Senior Festival & Geneva T20 Cup, the Independence Day cricket matches at Onex & the IAL Cricket Day in Cossonay. Can we match all that in 2019? Of course we will!